This earthwork was partially excavated in 1870, these revealed the foundations for a Roman villa of obvious opulence. It's final Roman owners were believed to have suffered a grisly death as the villa burnt around them. It is likely that future excavations will reveal that the villa was built over of an earlier tribal centre. Probably replacing the shrine to the "Light Water" with a more Mediterranean alternative. Plan of Castle Dykes showing Villa foundations excavated in 1866-75 by W. Lukis. 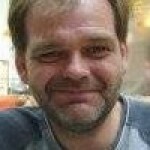 Picture from RAI Journal 31. 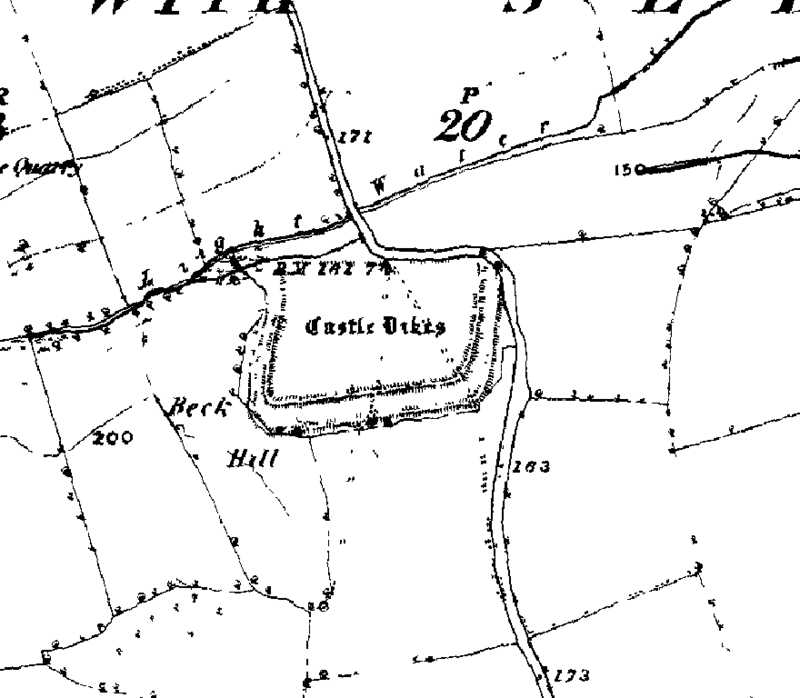 Castle dykes is located just off the A6108 3.5 miles north of Ripon in North Yorkshire. Today it serves to protect the entrance to Lightwater Valley leisure park, but it's earthwork embankments still serve to remind us of a more glorious past. "That which led to the exploration was the discovery, in 1866 of a rare coin, a second brass of Manilia Scantilla, in a field on the north side of the swamp, of fragments of flanged roofing tiles in another field on the same side, and within the entrenched enclosure itself of a tessera on a mole heap in the south west angle." Wife of Didius Julianus, a wealthy but worthless merchant, who purchased the Imperial Purple, and after a reign of sixty-six days was put to death A.D. 193. The coin was probably brought over by a senior officer of Clodius Albinus, who was hailed Caesar of Gaul and Britain after Julinus' execution. Albinus himself was executed in A.D. 197. 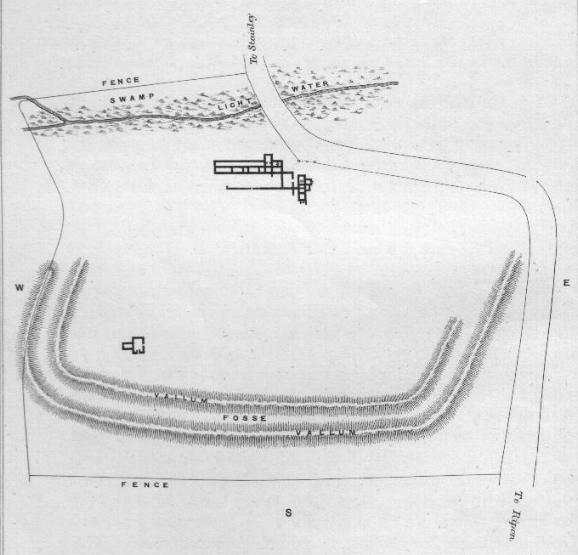 From W. Lukis' original report, there was little investigation of possible occupation prior to this Roman phase, however similarities between this site and others in the region make it reasonable to suggest that this site represents a late Iron Age settlement which came under the ownership of a wealthy legionary soon after the Roman invasion. The siting of the main dwelling, firmly to the North of the enclosed area indicates it may have been built alongside an existing enclosure rather than at the same time. 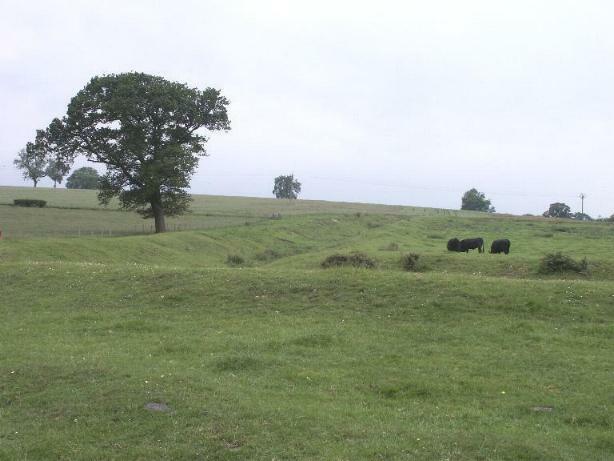 In his report Lukis examines the earthwork, a small building held within it, and a much larger dwelling area to the north of the enclosure. The larger buildings being the main focus of investigations. The southwestern 'corner' is actually curved, it looks like a corner due to a later path. 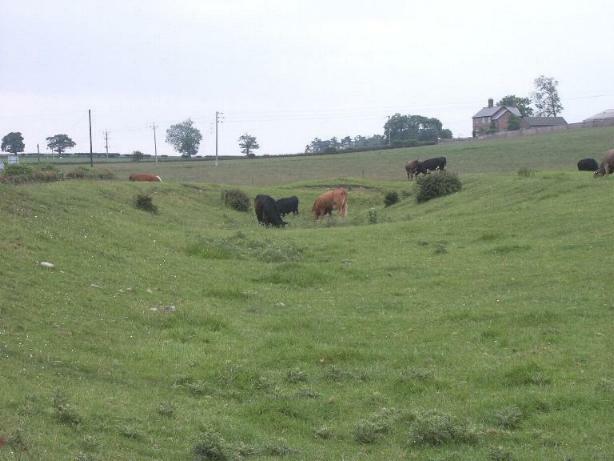 The earthwork was shown to have a rock cut ditch to a depth of 3.0m, it had a bank either side and the inner mound rose to a height of 7m from the bottom of the ditch. 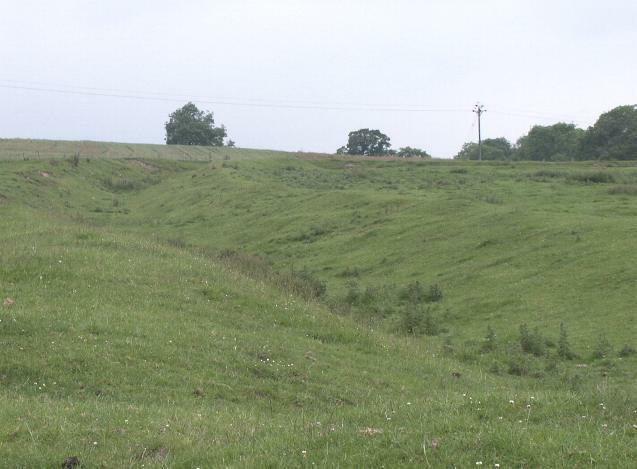 Lukis found no evidence of the inner rampart having a stone wall and concluded that it had a wooden palisade fence. The smaller building within the enclosure was found to have two rooms, in one of which two skulls were found. These rooms were heated by a hypocaust system fed by a furnace. The main dwelling area to the north comprised of two large buildings set within a central passage. The largest building measured c. 10m x 3.5m. Both buildings had hypocaust heated rooms, the larger having several baths and various rooms and anti-chambers. Western Rampart of the defended enclosure. The excavations revealed that the original fine building had been destroyed by fire, it's occupants - a family with children were killed and left to burn, the skeletons of adults, children and infants were found scattered within the foundations of this original villa. It is possible that two human skulls found in the building within the enclosure to the south could also belong to this period - possible escapees, perhaps. Following this bloody episode Castle Dykes was rebuilt several times in the Roman Period, but never again with the same degree of quality, the site seemingly moved from military to private occupation. In the main area, a total of seven baths were located, these were used over at least four stages of occupation where the villa benefited from significant remodeling. At any one time no more than three baths were in use. "That the buildings must have been of considerable importance is evident from what has been stated, but the presence of stone column, resembling those which have been used at Aldborough, and other places, to adorn the facades of temples and the porticos of public buildings strengthens the opinion the Castle Dykes was a station of no mean importance." W. Lukis 1875. Castle Dykes south western corner, from the southern rampart. Unfortunately at the time of the excavation little was known about the stratification of finds, and the report tend to lump together all item found, however the author was able suggest that the original buildings were of the finest quality and were probably in existence in A.D. 120, these original buildings were destroyed by fire as part of a murderous assault on the household. Later during the Roman period dwellings were built over these, by overlaying the original foundations with 30cm of soil and laying new foundations on top. These later dwellings underwent several modifications until finally falling out of use. Only Roman artifacts were found, indicating a broad duration of occupation from c. 120 - 350 A.D. Notable finds include coins (Volusianus, Constantius, Gallus and Postumus), Samian ware pottery, a bronze armlet (on one of the bodies), window glass and Oyster shells. Also notable were the array of human and animal footprints on the tiles. Evidence from the abundant plaster showed some rooms had been completely replastered three times. 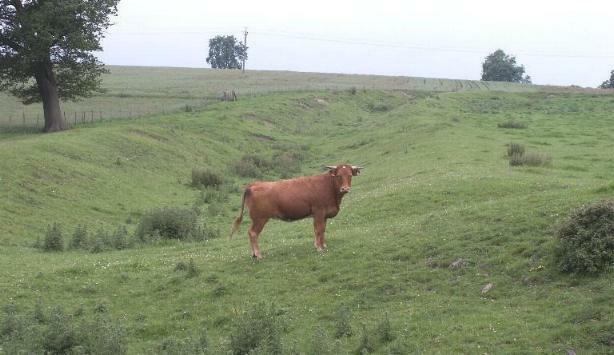 More detail of the SW corner intrusion, and a fine bull.